Visitors to the 7th annual Taste of Dublin Festival will get to sip and savour the craft brewed taste of Smithwick’s Pale Ale, the new addition to the Smithwick’s range. The theme of this year's festival is ‘Proud to be Irish’ and with Smithwick’s 300 years of history and heritage it's no wonder they've been invited to attend. While it may be the newest addition to the family, Smithwick's Pale Ale's craft brewed nature make it a true artisan beverage. 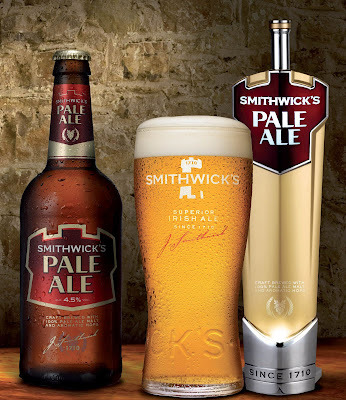 Brewed in individual batches using the finest ingredients: aromatic Amarillo hops, 100% pale ale malt and the prized Smithwick’s yeast, Smithwick’s Pale Ale is a delicious full tasting beer with a long finish, rich golden colour and creamy head. For those yet to try it, I highly recommend giving it a go. Its unique ingredient combination gives it a distinctive flavour. Visitors to the Iveagh Gardens, the Taste of Dublin's home, will be treated to a feast for the senses from 20 of Dublin’s top restaurants including interactive master classes and live entertainment on two stages. The festival will be launched this year by Jamie Oliver and he will also be giving a live cooking demonstration on stage during the event. Other guests include: Rachel Allen, Valentine Warner, Oliver Dunne, Richard Lewis and Ross Lewis. For more information, visit: www.facebook.com/smithwicks or www.tasteofdublin.ie.